Okinawa Prefectur (沖縄県, Japanese: Okinawa-ken, Okinawan: Uchinaa-ken) is ane o Japan's soothren prefecturs. 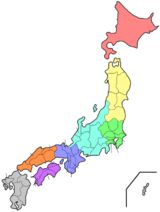 It consists o hunders o the Ryukyu Islands in a chain ower 1,000 kilometres (620 mi) lang, which extends soothwast frae Kyūshū (the soothwastmaist o Japan's main fower islands) tae Taiwan. Okinawa's caipital, Naha, is locatit in the soothren pairt o Okinawa Island. The disputit Senkaku Islands (Mandarin: Diaoyu Islands) are admeenistered as pairt o Okinawa Prefectur. ↑ Nussbaum, Louis-Frédéric. (2005). "Okinawa-ken" in Japan Encyclopedia, p. 746-747 at Google Books. ↑ Nussbaum, "Naha" in p. 686 at Google Books. Wikimedia Commons haes media relatit tae Okinawa Prefecture. This page wis last eeditit on 8 Mairch 2018, at 04:43.